Oh, yes, I am a hand quilter and have been for a very long time. When I started quilting I only pieced a quilt so I would have something to hand quilt. I tried machine quilting but did not enjoy it so now I only machine quilt doll quilts for charity. I tried a big frame, I tried the PCV frame, I tried using hoops but I really enjoy using no frame/hoop. I get my quilt tops basted by a long armer quilter, then I sit in my favorite chair and do the hand quilting. I take out the machine quilting as I go so when I am done, I’m done. I will admit to switching to the “big stitch” using a size 12 perle cotton from Presencia. Note: I own a small quilt shop and have 126 color for sale. I also love to do hand quilting, but the way I see it, if you’re going to do this work by hand, you should be able to see it clearly. I love to do big stitch hand quilting with perle cotton, #8. The colors are vibrant, and the quilting adds a lot of dimension and texture to your quilt. 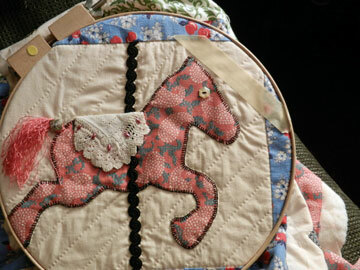 I like to combine the hand quilting with machine quilting and embellishment. The mixture of techniques really makes your quilt so interesting and appealing. Although I do simple machine quilting on charity quilts, I always have a hand quilting project nearby. I finished hand quilting an enormous whole cloth quilt last spring and it will be the only one I ever do. I’m satisfied with the results but it took me three years. I did the entire quilt using a large hoop on my lap and putting it aside in the summer when I started to swelter under all that fabric. I’m always searching for the perfect quilting thimble. Any suggestions? For me, the perfect thimble is a metal one, but don’t buy a new one. Go to an antique store and buy an old one. They have better dimples on the sides and those are the dimples that our grandmothers used, not the end of the needle. I love hand quilting and I love machine quilting. And, I often do both on the same quilt. Hand quilting can add so much but only if it’s seen. On areas that are busy and have a lot of seams, machine work is my solution. Hi Sharon, I don’t love to stipple either, but sometimes it is necessary. I remember a quilt I made with a friend – when it was my turn to quilt it I did a bit of stippling, when it was her turn she said her stippling didn’t look like mine and I got to do all the stippling. I wonder who that was??? Oh well, her quilting was wonderful and the quilt was award winning :-). Thanks Sharon! Of course, my stippling doesn’t look like yours. I’ve found stippling is as individual as handwriting. Sorry about that, but it worked out so well for me……. Like most have tried it all, frame, hoop, stab and stitch, no hoop, big stitches, little. Enjoy the process and if I don’t have a project going, think I should. Mostly projects are small. Did one large quilt and took me years to finish. Mainly I machine quilt but “little” projects I hand quilt and loveit…thanks for the tip about “big” stitches…sometimes I think mine will never be any smaller! And the idea of those lucious threads so it shows up! Awesome…maybe I will get my son’s Civil War wall hanging done finally. It’s called Gettysburg Sun and has twelve blocks, tiny tiny suns. Never did anything so small! I am a hand quilter… and happened on your blog by chance. I love your little block in the picture! How sweet!